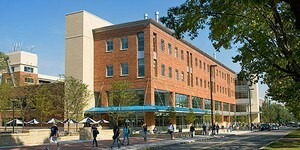 Penn State's University Park Campus. distributed on June 3, during the check-in for the course. Most visitors to the Berkey Creamery at Penn State know only of its famous ice cream, sherbert and cheeses sold at the store or over the Internet, but what they don't know is that it is the largest university creamery in the nation. Each year approximately 4.5 million pounds of milk pass through the Creamery's stainless steel holding tanks. About half comes from a 225-cow herd at the University's Dairy Production Research Center, and the rest is purchased from an independent milk producer.